DAYTON, Ohio (November 28, 2018) – A proposal to lower education costs for service men and women and their children in the state of Ohio has taken a step toward becoming a reality. The bill, known as House Bill 603, was unanimously passed by a house committee today. DACC Exec. VP Chris Kershner testifies before the house committee for House Bill 603. 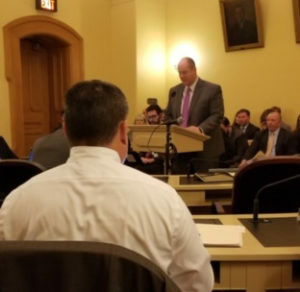 House Bill 603 was initiated by the Dayton Area Chamber of Commerce’s Military Advocacy Committee in the spring of 2018. 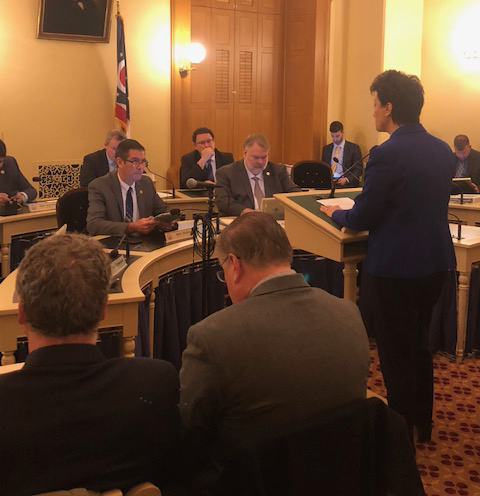 The bill would eliminate the rule that requires Ohio residents to live in the state for a full year before becoming eligible for in-state tuition for military service members and their children. “A lot of individuals in the military are on two year tours at different bases,” said Chris Kershner, Executive Vice President, Dayton Area Chamber of Commerce. Many of those service members come with school-age dependents, who want to start college when they arrive at a new base such as Wright Patterson Air Force Base. Former Wright Patt Commander Cassie Barlow before the Ohio House committee reviewing House Bill 603. “They have been serving our country, the least we could do is provide in state tuition benefits to them and their dependents,” said Kershner. Long term, the chamber hopes military children will consider staying in Ohio to finish their education and start their careers. “The long term benefit is, we’re capturing that talent. Those dependents are going to one of our area colleges, they hopefully get a job here after they graduate, and become residents of Ohio,” Kershner said. 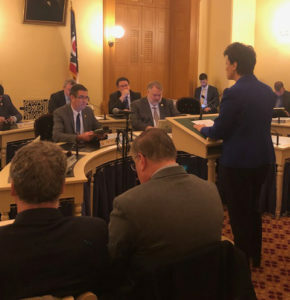 Representatives from the Dayton Area Chamber of Commerce testified before the house committee in favor of the bill, as did former Wright Patterson Air Force Base Commander Cassie Barlow (Col. Ret. ), and Dayton Development Coalition President Jeff Hoagland. Representative Rick Perales of Beavercreek sponsored the bill. House Bill 603 will now go to the House Floor for a vote by the Ohio House of Representatives.